The occurrence of large damaging earthquakes near densely populated regions can result in dramatic numbers of human casualties, damage to key infrastructure (e.g. hospitals, roads) and the loss of accommodation for hundreds of thousands citizens. The largest earthquake magnitudes on Earth reach magnitudes M~9 and exclusively occur along subduction zones. In contrast, strike-slip transform faults tend to rupture in earthquakes with magnitudes not exceeding M~8 [e.g. Wesnousky, 1988; Martínez-Garzón et al., 2015; Bohnhoff et al., 2016]. However, the latter generally pose a larger hazard and risk since they can rupture along the Earths’ surface and due to their eventual proximity to densely-populated mega-cities. Well-known examples are the San Francisco Bay Area and the Los Angeles basin along the San Andreas Fault in California or the Istanbul-Marmara region near the North Anatolian Fault Zone in Turkey. High-resolution monitoring and near-real time analysis of ongoing seismic and aseismic deformation in these areas is an essential pre-requisite to better determine the local seismic potential and to optimize risk-reduction infrastructure. A large focus of SAIDAN is the study of tectonic deformation at the North Anatolian Fault. The North Anatolian Fault Zone (NAFZ) in Turkey represents a ~1100 km long right-lateral strike-slip plate boundary [Barka et al., 2002; Sengör, 2005] slipping at an average rate of 20-30 mm/yr [McClusky et al., 2000; Ergintav et al., 2014]. The Sea of Marmara region in northwestern Turkey currently represents a ‘seismic gap’ with a high probability for an M>7 earthquake in direct proximity to the Istanbul Metropolitan region with its >13 million inhabitants. At its eastern portion close to Istanbul (Princes Islands fault), a locked fault portion representing a potential nucleation point for the pending Marmara earthquake was identified from absence of microseismicity and from GPS data [Bohnhoff et al., 2013; Ergintav et al., 2014]. Towards the western part of the Marmara section there are first indications for fault creep [Schmittbuhl et al., 2016; Bohnhoff et al., in press]. However, to date, no information on potential low-frequency signals embedded in the crustal deformation of the whole region exists. The area immediately to the south of the locked Princes Islands fault recently hosted a MW 4.2 earthquake that showed pre-shock activity indicating an emergent failure process [Malin et al., in review]. 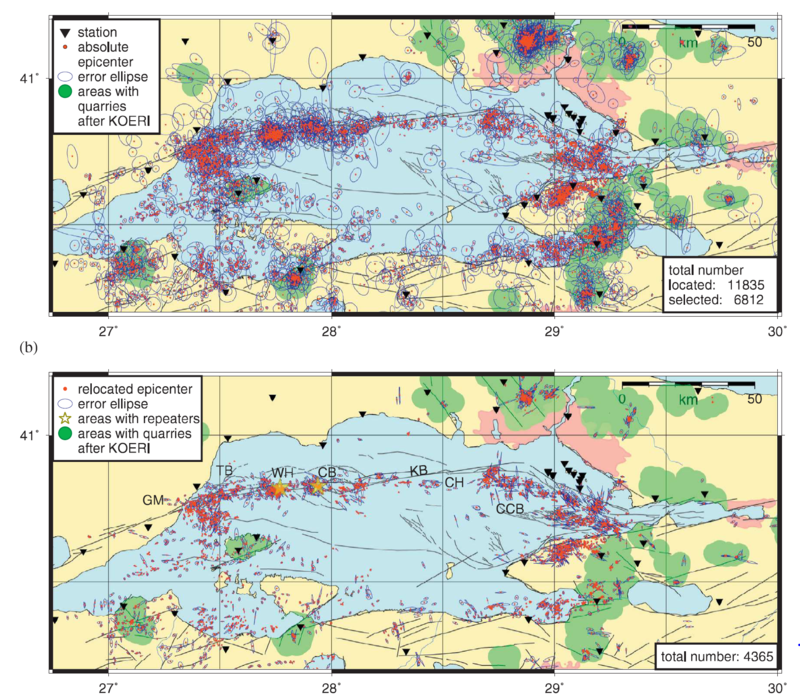 Discriminating between a creeping and a locked status of active faults is of central relevance to characterize potential rupture scenarios of future earthquakes and the associated seismic hazard for nearby population centres. In this respect, highly similar earthquakes that repeatedly activate the same patch of an active fault portion are an important diagnostic tool to identify and possibly even quantify the amount of fault creep. for the larger Marmara region. While the eastern portion of the Marmara seismic gap has been identified to be locked, only sparse information on the deformation status has been reported for its western part. Our findings indicate that the western Marmara section deforms aseismically to a substantial extent, which reduces the probability for this region to host a nucleation point for the pending Marmara earthquake. This is of relevance, since a nucleation of the Marmara event in the west and subsequent eastward rupture propagation towards the Istanbul metropolitan region would result in a substantially higher seismic hazard and resulting risk than if the earthquake would nucleate in the east and thus propagate westward away from the population centre Istanbul. We studied spatiotemporal -value variations along the North Anatolian Fault Zone in northwestern Turkey with a focus on the combined 1999 Izmit and Düzce rupture and the eastern Sea of Marmara. 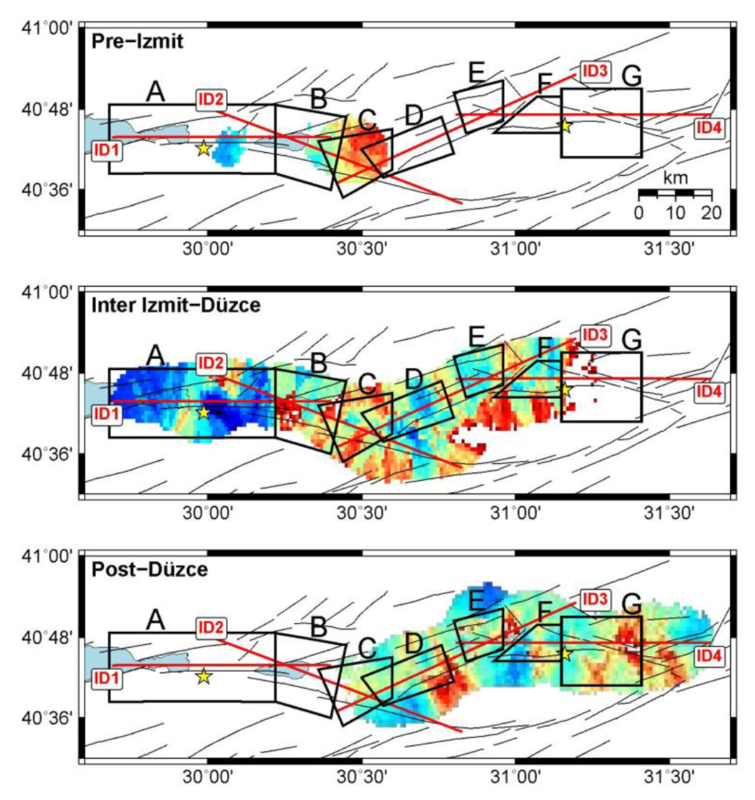 We used a local seismicity catalog of the Izmit-Düzce region covering a time span from 2.5 years prior to the Izmit until 14 months after the Düzce mainshock and a four-year hypocenter catalog in the eastern Sea of Marmara. We consistently calculated moment magnitudes to ensure a homogeneous dataset and applied strict quality criteria. This allows studying variations of -values throughout the region and at different stages of the seismic cycle. With a standard gridding technique -value maps, depth sections and time series were calculated which reveal a very heterogeneous -value distribution in the study area. The variety of -value observations cannot be interpreted unambiguously, given that the -value most likely depends on a combination of fault-zone characteristics like local stress conditions, heterogeneity of the crust and damage distribution. By presenting a comprehensive set of possible interpretations we point out that a biased discussion of the results towards stress or another individual parameter may lead to erroneous conclusions. Furthermore, the applied data discretization scheme influences the appearance of the final -value distribution leading to potential misinterpretations. 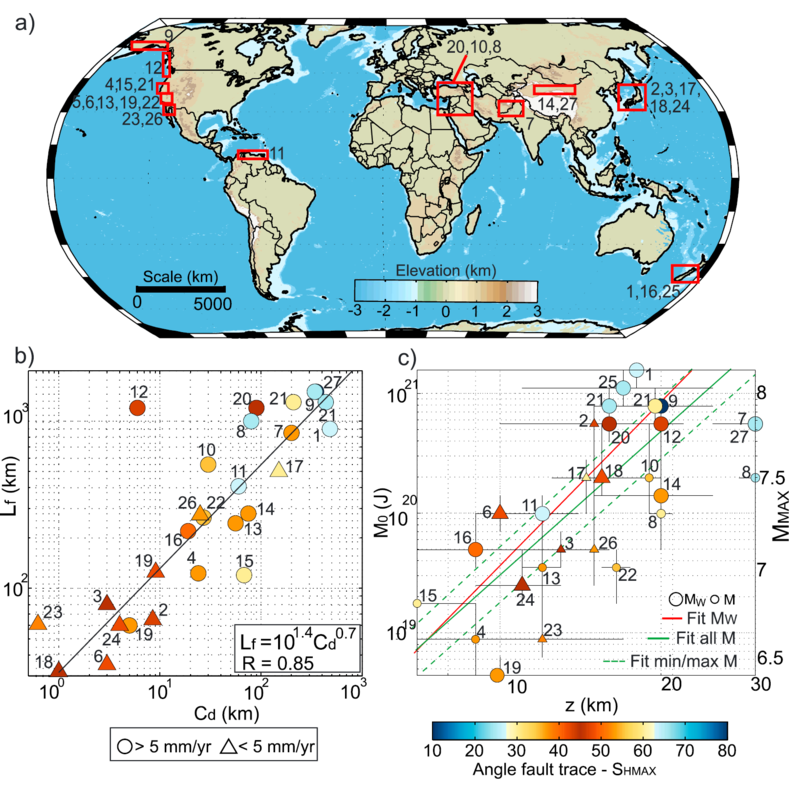 Constraining the maximum likely magnitude of future earthquakes on continental transform faults has fundamental consequences for the expected seismic hazard. Since the recurrence time for those earthquakes is typically longer than a century, such estimates rely primarily on well-documented historical earthquake catalogues, when available. Here we discuss the maximum observed earthquake magnitudes along different sections of the North Anatolian Fault Zone (NAFZ) in relation to the age of the fault activity, cumulative offset, slip rate and maximum length of coherent fault segments. The findings are based on a newly compiled catalogue of historical earthquakes in the region, using the extensive literary sources that exist owing to the long civilization record. We find that the largest M7.8-8.0 earthquakes are exclusively observed along the older eastern part of the NAFZ that also has longer coherent fault segments. In contrast, the maximum observed events on the younger western part where the fault branches into two or more strands are smaller. No first-order relations between maximum magnitudes and fault offset or slip rates are found. The results suggest that the maximum expected earthquake magnitude in the densely populated Marmara-Istanbul region would probably not exceed M7.5. The findings are consistent with available knowledge for the San Andreas Fault and Dead Sea Transform, and can help estimating hazard potential associated with different sections of large transform faults. We test potential scaling between observed maximume arthquake magnitudes along 27 strike-slip faults with various properties including cumulative displacement, mapped fault length, seismogenic thickness, slip rates, and angle between fault strike and maximum horizontal stress. For 75–80% of the data set, the observed maximum scalar moment scales with the product of seismogenic thickness and either cumulative displacement or mapped fault length. Most faults from this population have slip rates >5mm/yr (interpolate faults), cumulative displacement>10 km, and relatively high angles to themaximum horizontal stress orientation. The remaining 20–25% population involves events at some distance from a plate boundary with slip rate <5mm/yr, cumulative displacements <10km, and ≈ 45° to the maximum horizontal stress. These earthquakes have larger magnitudes than the previous population, likely because of larger stress drops. The most likely interpretation of the results is that themaximum rupture length, and hence earthquake magnitudes, correlates with the cumulative displacement and the fault surface length. The results also suggest that progressive fault smoothing may lead to decreasing coseismic stress drops. We present a refined hypocenter catalog for the Sea of Marmara. For the first time we combine the different regional permanent networks thereby optimizing azimuthal coverage and adopt a refined technique to determine precise onset times for the different body waves. 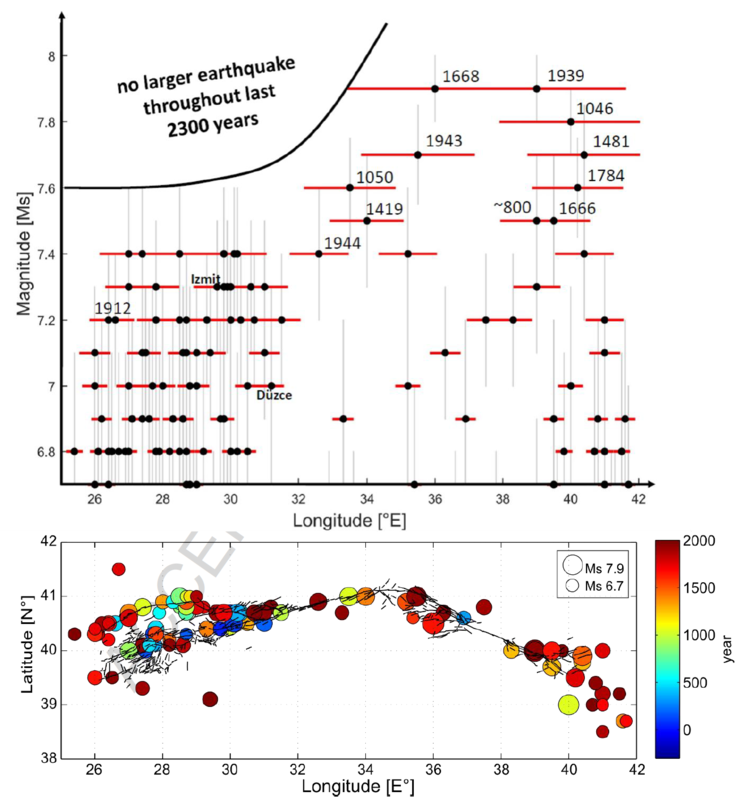 Our catalog covers a ten-year time interval (2006-2016) containing optimized and relocated hypocenter locations for 4,407 earthquakes with an unprecedented regional magnitude of completeness of Mc = 2.0. The epicentral distribution delineates the Marmara Section as the northern NAFZ branch as the seismically most active fault strand. Single-event focal mechanisms for the larger (M up to 4.5) events indicate that currently both strike-slip and normal faulting occurs, confirming the transtensional setting of the region. We derive the stress tensor and its local variations throughout the Marmara region, Turkey. We find a combined strike-slip and normal faulting stress field for the Marmara region generally reflecting the overall transtensional setting. However, the results show moderate local variations of the stress field. The eastern Sea of Marmara shows local stress field orientations with pronounced strike-slip (northern part) and normal faulting (southern part) components. 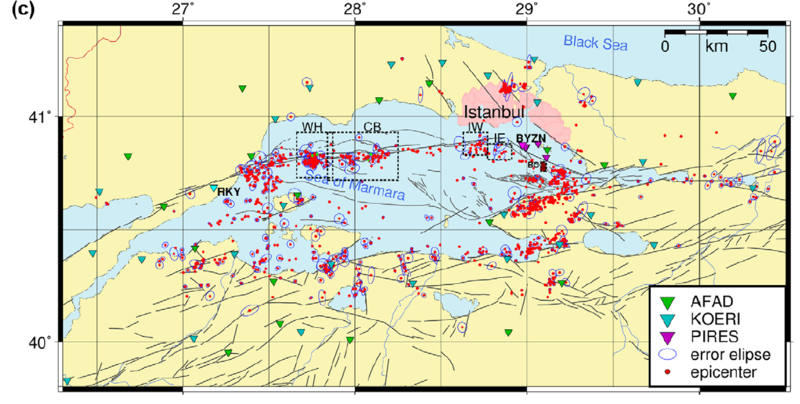 Along the central Marmara region, normal faulting tends to dominate, while a well resolved strike-slip stress regime is found in the western Sea of Marmara region. Regarding the faulting mechanism of an earthquake with magnitude up to 7.4 which is expected in this area in direct vicinity of the Istanbul metropolitan region, our results imply that neither strike-slip nor normal faulting kinematics can be excluded.